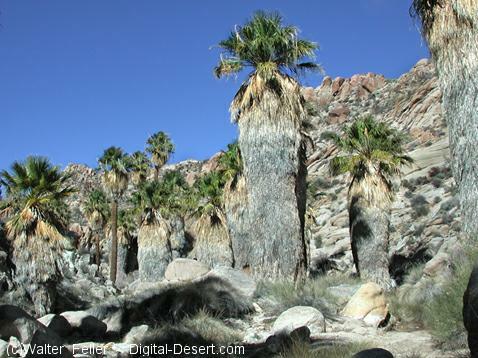 Lost Palms Oasis is a native fan palm oasis with over 110 palm trees. The trees are located in a deep canyon with steep walls of quartz monzogranite. The palms are fed by an underground spring, of which several small pools of water are spread out through the oasis. The canyon is an ideal habitat for Desert Bighorn sheep. Description: A canyon with numerous palm stands. A side trip to Victory Palms and Munsen Canyon involves boulder scrambling. Difficulty = Moderate to oasis overlook then strenuous.